This week's topic has a provocative title: Refuse to be Dumbed Down. I know that am not alone in noticing the dumbing down of culture: in our TV shows, in our music, in our movies and in the articles we read online. Shock-value, lowbrow humor and vulgarities in every sense of the term have infiltrated our everyday lives. It is becoming increasingly harder to find culture, refinement, true art and class. But... all hope is not lost. We can seek out the artists who are truly talented and make art that benefits society. We can watch the TV shows that are in line with our values. We can patronize movies with meaningful stories to tell that don't insult our intelligence. We can seek out music by talented musicians that move and inspire us. We can not give our attention to the crass celebrities of the world. We can read books and publications that cultivate our mind. We can empower ourselves to keep an open mind and to follow our instinct. We can seek out the arts in our community. We can cultivate our own art, whether it's playing the piano again or writing that novel you've always wanted to write. We can remain assured that no matter what direction the world is going, we refuse to be dumbed down with it. This week do something you wouldn't ordinarily do: listen to a symphony on YouTube while you file the bills, get a friend and go see an independent film or go sit in the park with a good book of poetry. Take time to cultivate your mind again enjoy the moment thoroughly. Jennifer, in your first book, this was the topic that inspired me the most. I think you could dedicate a whole book to the topic of cultivating your mind. A new study reveled that, compared to previous generations, this generation is the most underexposed to the arts. I work directly in education and the arts; I have had the privilege of exposing children to the arts through galleries, ballet, and theater. Please continue to talk more about this topic. We need it. Rosemary, thank you for your comment! Exposure to the arts is a major issue. With many arts programs being cut, for many children, the only exposure to the arts they get are the music videos they see on television, songs they hear on the radio and stars they see on the magazine covers. As a society I believe we must come together to expose our children to different and varied arts apart from today's popular culture. I used to work for a company called, Will & Co., performing Shakespeare for children so this is a topic near and dear to my heart! **Announcement: from now on, blog posts and videos will be uploaded on Mondays (not Sundays) thank you in advance for your understanding! I hinted that I had a special plan for the denim Talbots dress in my fall/ winter ten-item wardrobe and today, I reveal the plan! I loved this dress. It is made of quality fabric, is the perfect length and washes really well. I liked this dress so much I'd like to continue wearing it for spring/ summer 2015. In order to make this work, I decided to have the sleeves tailored short. The long sleeves would have been too heavy for the hot California summer. In this week's video I show you the before and after and I am thrilled with the result! 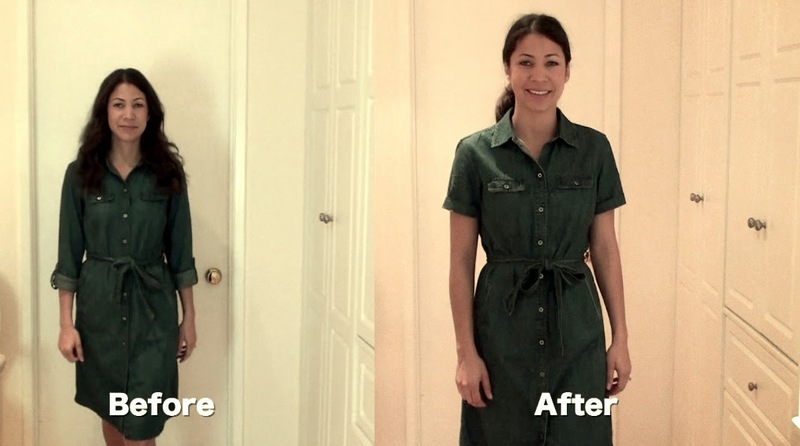 Using a tailor to alter your beloved clothes is a great way to feel like you are getting a "new" dress but still keep the same one. The tailoring cost $18 (which is probably an inflated price seeing that I am in Santa Monica) and for that amount I feel like I have an entirely new dress to wear for the next few months. As spring approaches (fall for our Southern Hemisphere friends) start thinking about your upcoming ten-item wardrobe. As the weather turns, start packing away your out-of-season clothes. If there was an item you just can't part with, consider tailoring it to fit the upcoming season. If not, pack your clothes away knowing you'll be happy to see them when the weather turns again. This was my first true 10 item season (last year I was down to about 20-25). A few notes: you can only do this if you have control over your laundry - when traveling for longer periods where you have to rely on the speed of laundry service it can get a bit challenging.) My second problem was my jeans, which was a BIG staple, died an unfortunate death and could not be repaired. Where I live, shopping is not a matter of popping to the local mall. Ouch. Lesson learned? For my lifestyle, one or two spares are essential. Hannelene, I love that you have tried it and adapted the ten-item wardrobe to work with your life situation. I hope you continue to enjoy it and its vast benefits! Thanks for your question Heather. Rebecca Taylor makes beautiful, high quality clothes. I have had a few of her silk dresses in the past and was able to wash them on the "hand wash" or delicate cycle in a mesh laundry bag on cold with a gentle detergent. I then would hang them to dry and use an iron on the silk setting if necessary. It's a week of how-to's on The Daily Connoisseur as I have a fun bonus hair tutorial for you today. Many women own a hair claw but only know a few ways to use it. Today I show you my favorite way to use a hair claw. This look works best on medium to long hair. Take the remaining hair and twist all the way to the ends. Then bring the twisted hair back up in a U-shape, parallel to the hair claw. Then take the hair claw and re-open it to include the twisted hair. Leave the strands out for a more casual look or tuck in the hair for a chic, more polished look. 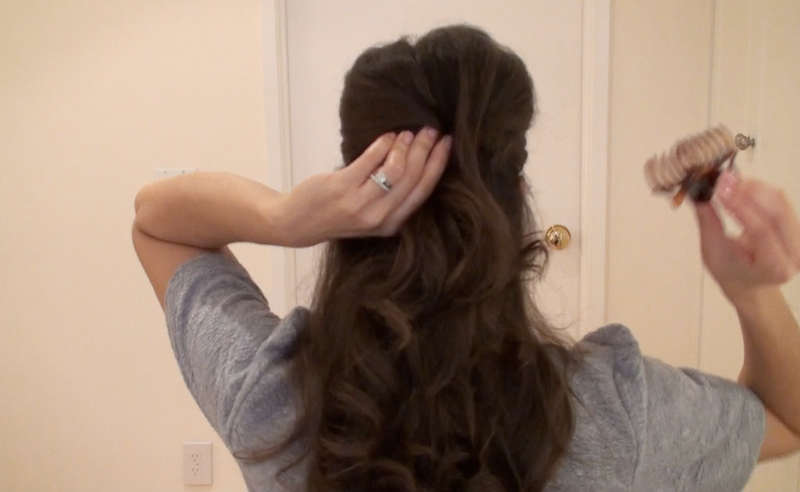 Be sure to tug the hair up at the crown of the head to create volume without having to tease. This is a great look for bad hair days or for when you need a fast and easy, yet elegant way to get the hair out of your face. York Avenue blog says At Home With Madame Chic would make a great gift. 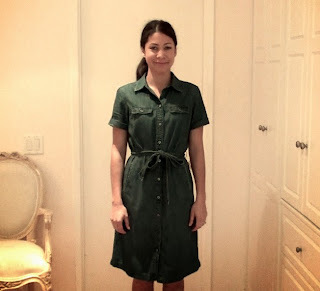 Elle en Jetset blog cites Lessons from Madame Chic in her blogpost on the perfect tee shirt. Check out my interview discussing parenting and much more on Motherhood Moment. I hope you enjoyed today's bonus video! Let me know what you think in the comment section. Have a beautiful Valentine's Day weekend. See you soon! 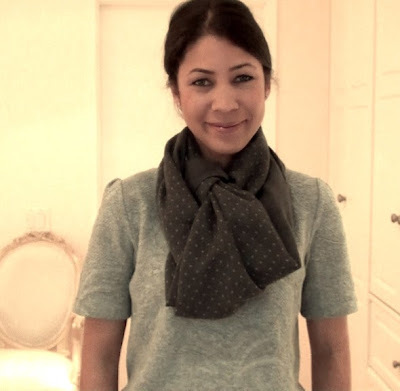 This week I have a fun scarf tutorial for you. Sometimes all you need to perk up your wardrobe is something as simple as tying your scarf in a new way. I received this beautiful Massimo Dutti scarf as a Christmas present from my in-laws and it pairs beautifully with my jacquard grey Loft tee, black fluid ankle pants and London Sole ballet slippers. Paired with a cardigan or coat, you are ready to step out into a brisk winter day, chic and refined. Place the scarf around your neck making sure the ends are even. Tie the scarf in a loose knot in front of your neck. 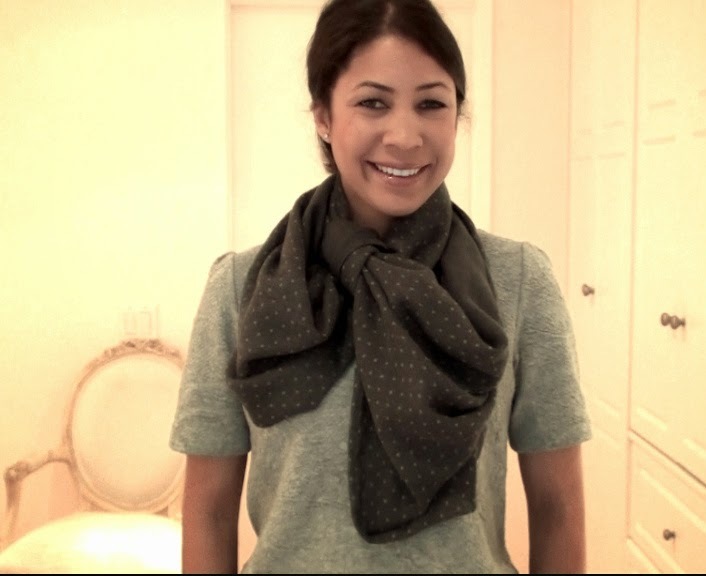 Then take the bottom outermost edges of the scarf and tie them in a knot around the back of your neck. This is why I call it the butterfly knot because the front part of the scarf now looks like butterfly wings. Tuck the shorter end into the longer end for a chicer look that provides more warmth. Abby from To Form a More Perfect Union blog writes of At Home With Madame Chic: "I devoured this book, stopping only because I was so inspired by her words that I needed to immediately execute them in my home". Tips on Life and Love quote At Home With Madame Chic on Why You Should Embrace Your Femininity. As you curb back on shopping and cultivate gratitude for the things you already have, you might find yourself getting "bored" with your belongings, particularly your clothes. Inspire yourself to look at your clothes and accessories with new eyes, trying new combinations or experimenting with new ways to present yourself, such as tying your scarf a different way. Take pleasure in the small things and fight the urge to always need something new. Our Small Space writes on last week's Ten-Item Wardrobe Check-In: The number nerd in me quickly caught on to something. I think you're saying in the video that your ATL/mid-level mall clothes were 1/3 the price of higher-end brands, and that high end brands last 3 times as long. So for those of us who take cost-per-wear into account when budgeting for clothes it would seem they work out about the same. Thank you for your comment! In most cases, I would say that the longer lasting, more expensive clothes cost about the same as the shorter lasting cheaper clothes on a cost-per-wear basis. This rule can bend, however. Some of the cheaper clothes might not last very long at all. And some of the high-quality clothes can last a really long time. It is a rule with many variables. The key is to find the highest quality clothes at the price point you can currently afford to get the maximum benefit. Amber asks if I have any tips about the ten-item wardrobe with relation to long-term weight loss. Amber, thank you for your question! One great tip for this particular situation is to find a great tailor. If you have a high-quality garment you love that no longer fits you due to weight loss, you'd be amazed what a tailor can do. I was just in the tailor's last week and saw a woman having several items of clothing "taken in" due to weight loss. You don't need to live in a perpetual grey area wondering when you can get started on your wardrobe. Empower yourself by dressing well today no matter what size you are and the rest will fall into place. 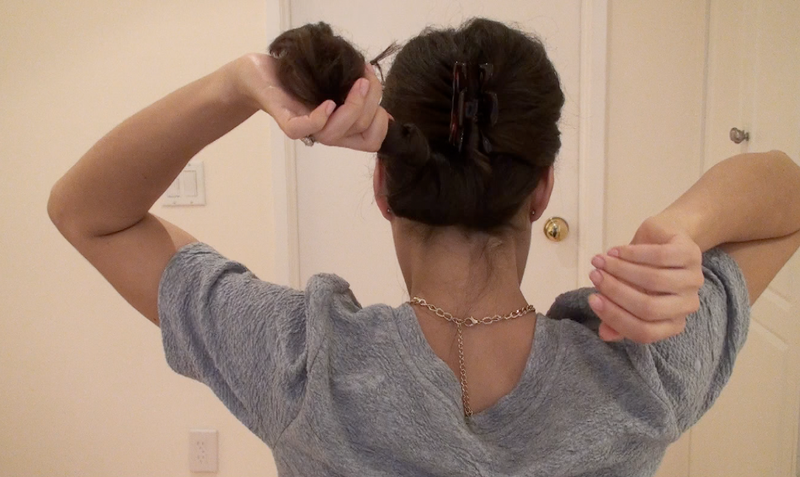 See you this Thursday for a bonus video on another fun beauty tutorial! This year's fall/ winter ten-item wardrobe was a bit of an experiment as I built the body of the core pieces primarily on budget finds from mid-level retailers. In this week's video I share with you my experience so far with these clothes. Which ones were good purchases and which ones were not? One of the many benefits of the ten-item wardrobe is that you are so conscious about the items you bring into your closet, that each one becomes a case-study. If you go through the season and one of the garments didn't work out (shrunk, you never wore it, you realized you don't like its style) you can analyze the problem and not make the mistake of buying a similar item again! In this week's video, I do not go through each of the ten items in my wardrobe, but share highlights of what worked and what didn't work. One of the Loft dresses, if you will remember from my ten-item talk-through, was of concern to me because I thought it might shrink and become too short. Lo and behold... it did! I knew this at the time... I had the instinct that the length of the dress might be a problem, yet I purchased it anyway. Why I didn't listen to my instinct, I'm not quite sure. But now I know to not purchase anything in the future that has a questionable length. I've learned my lesson! So, what's the crux of my thesis regarding high-quality vs. budget fashion? Purchasing higher-end brands like my favorite A.P.C. has it's major benefits. The clothes are of supreme quality and last a long time. I'm finding that they last around 3 times longer than the less expensive brands like Loft. On the other hand, Loft is more affordable. Also, some women might get bored of wearing the same garment for many years in a row and prefer more "temporary" pieces. Regarding budget, you must be able to completely afford the higher-end brand at the point of purchase as I never advocate incurring debt due to clothes shopping. If you can afford the higher-end, higher quality purchase and are prepared (and excited!) to have your garment last more than one or two seasons, then it's worth considering the investment piece. If you cannot afford the higher-end brand right off the bat, then I do recommend the less expensive brands. If you shop carefully, your clothes can last past the season, ending up providing excellent savings in the end. Ultimately the best choice for many people, I believe, is a healthy mix of the two. Have one or two high-end pieces in your wardrobe and supplement with more affordable brands. Driven Woman blog cites my TEDx talk on the ten-item wardrobe as inspiration for her post, Wardrobe Secrets of a Driven Woman. This week, go through the garments in your fall/ winter wardrobe and examine why some pieces worked and some pieces didn't. For the ones that didn't work, figure out why and make a note to learn that style lesson and make a better choice in the future. Just imagine, one day, you will be so in tune with your true style and make such wise wardrobe purchases, all of your pieces will live in harmony and integrity. I need self discipline to challenge myself to seek out the arts. Too often, I let these chances for life enrichment pass me by! Please, could you devote some time this year to tips in this area? I am going post a future video on the dumbing-down of popular culture and how we can escape it. Please look for this in the near future! As always, it is a pleasure to watch your weekly video! With regards to self-discipline, I have you to thank for assisting me with shopping - mainly clothes shopping with the 10 Item Wardrobe, but other things too. It then hit me that I no longer feel like this when shopping. I now go out with firm ideas of what it is that I am buying, and I am in control, sale or no sale. If you are looking for a good, thought-provoking, realistic film, I highly recommend Force Majeure, a Sweedish film, directed by Ruben Östlund. This marital drama follows a young Sweedish family as they vacation in the French Alps. I don't want to give anything else away but highly recommend you view it! It's the first film I've seen in a long time that really impressed me.